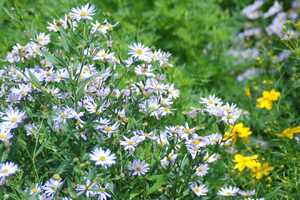 Long blooming, drought tolerant, compact plant with daisy-like blooms of pale blue petals with a yellow center. Very hardy, tolerant to heat, drought and humidity. Also tolerant to a wide range of soil conditions. Daisy-like blooms with pale blue petals. Extended bloom time.